Canterbury Cathedral in Canterbury, Kent, is one of the oldest and most famous Christian structures in England and forms part of a World Heritage Site. It is the cathedral of the Archbishop of Canterbury, currently Justin Welby, leader of the Church of England and symbolic leader of the worldwide Anglican Communion; the archbishop, being suitably occupied with national and international matters, delegates the most of his functions as diocesan bishop to the Bishop suffragan of Dover, currently Trevor Willmott. 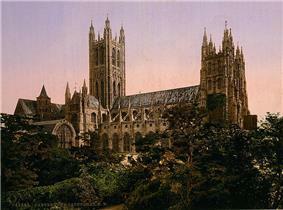 Its formal title is the Cathedral and Metropolitical Church of Christ at Canterbury. Christianity had started to become powerful in the Roman Empire around the third century. Following the conversion of Augustine of Hippo in the 4th century, the influence of Christianity grew steadily . The cathedral's first bishop was Augustine of Canterbury, previously abbot of St. Andrew's Benedictine Abbey in Rome; when other dioceses were founded in England he was made archbishop. He was sent by Pope Gregory the Great in 596 as a missionary to the Anglo-Saxons. Augustine founded the cathedral in 597 and dedicated it to Jesus Christ, the Holy Saviour. Augustine also founded the Abbey of St. Peter and Paul outside the city walls. This was later rededicated to St. Augustine himself and was for many centuries the burial place of the successive archbishops. The abbey is part of the World Heritage Site of Canterbury, along with the cathedral and the ancient Church of St Martin. Bede recorded that Augustine reused a former Roman church. The oldest remains found during excavations beneath the present nave in 1993 were, however, parts of the foundations of an Anglo-Saxon building, which had been constructed across a Roman road. They indicate that the original church consisted of a nave, possibly with a narthex, and side-chapels to the north and south. A smaller subsidiary building was found to the south-west of these foundations. During the ninth or tenth century this church was replaced by a larger structure (49 m. by 23 m.) with a squared west end. It appears to have had a square central tower. The eleventh century chronicler Eadmer, who had known the Saxon cathedral as a boy, wrote that, in its arrangement, it resembled St Peter's in Rome, indicating that it was of basilican form, with an eastern apse. During the reforms of Dunstan, archbishop from 960 until his death in 988, a Benedictine abbey named Christ Church Priory was added to the cathedral. But the formal establishment as a monastery seems to date only to c.997 and the community only became fully monastic from Lanfranc's time onwards (with monastic constitutions addressed by him to prior Henry). Dunstan was buried on the south side of the high altar. 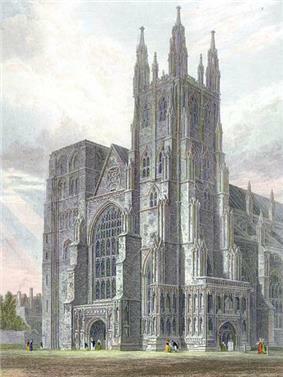 The cathedral was badly damaged during Danish raids on Canterbury in 1011. The Archbishop, Alphege, was taken hostage by the raiders and eventually killed at Greenwich on 19 April 1012, the first of Canterbury's five martyred archbishops. After this a western apse was added as an oratory of St. Mary, probably during the archbishopric of Lyfing (1013–1020) or Aethelnoth (1020–1038). 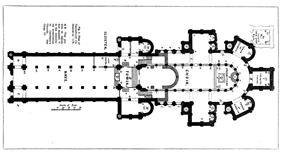 The 1993 excavations revealed that the new western apse was polygonal, and flanked by hexagonal towers, forming a westwork. It housed the archbishop's throne, with the altar of St Mary just to the east. At about the same time that the westwork was built, the arcade walls were strengthened and towers added to the eastern corners of the church. The cathedral was destroyed by fire in 1067, a year after the Norman Conquest. Rebuilding began in 1070 under the first Norman archbishop, Lanfranc (1070–77). He cleared the ruins and reconstructed the cathedral to a design based closely on that of the Abbey of St. Etienne in Caen, where he had previously been abbot, using stone brought from France. The new church, its central axis about 5m south of that of its predecessor, was a cruciform building, with an aisled nave of nine bays, a pair of towers at the west end, aiseless transepts with apsidal chapels, a low crossing tower, and a short choir ending in three apses. It was dedicated in 1077. The Norman cathedral, after its expansion by Ernulf and Conrad. Under Lanfranc's successor Anselm, who was twice exiled from England, the responsibility for the rebuilding or improvement of the cathedral's fabric was largely left in the hands of the priors. Following the election of Prior Ernulf in 1096, Lanfranc's inadequate east end was demolished, and replaced with an eastern arm 198 feet long, doubling the length of the cathedral. It was raised above a large and elaborately decorated crypt. Ernulf was succeeded in 1107 by Conrad, who completed the work by 1126. The new choir took the form of a complete church in itself, with its own transepts; the east end was semicircular in plan, with three chapels opening off an ambulatory. A free standing campanile was built on a mound in the cathedral precinct in about 1160. As with many Romanesque church buildings, the interior of the choir was richly embellished. William of Malmesbury wrote: "Nothing like it could be seen in England either for the light of its glass windows, the gleaming of its marble pavements, or the many-coloured paintings which led the eyes to the panelled ceiling above." 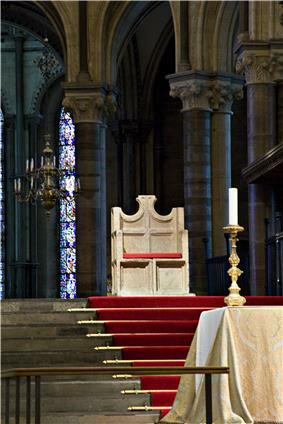 Though named after the sixth century founding archbishop, The Chair of St. Augustine, the ceremonial enthronement chair of the Archbishop of Canterbury, may date from the Norman period. Its first recorded use is in 1205. A pivotal moment in the history of the cathedral was the murder of the archbishop, Thomas Becket, in the north-west transept (also known as the Martyrdom) on Tuesday, 29 December 1170, by knights of King Henry II. The king had frequent conflicts with the strong-willed Becket and is said to have exclaimed in frustration, "Who will rid me of this turbulent priest?" The knights took it literally and murdered Becket in his own cathedral. Becket was the second of four Archbishops of Canterbury who were murdered (see also Alphege). 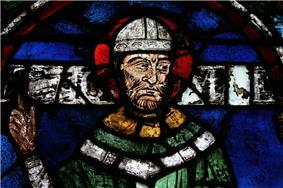 The posthumous veneration of Becket made the cathedral a place of pilgrimage. This brought both the need to expand the cathedral and the wealth that made it possible. In September 1174 the choir was severely damaged by fire, necessitating a major reconstruction, the progress of which was recorded in detail by a monk named Gervase. The crypt survived the fire intact, and it was found possible to retain the outer walls of the choir, which were increased in height by 12 feet (3.7 m) in the course of the rebuilding, but with the round-headed form of their windows left unchanged. Everything else was replaced in the new Gothic style, with pointed arches, rib vaulting and flying buttresses. The limestone used was imported from Caen in Normandy, and Purbeck marble was used for the shafting. The choir was back in use by 1180 and in that year the remains of St Dunstan and St Alphege were moved there from the crypt. The master-mason appointed to rebuild the choir was a Frenchman, William of Sens. Following his injury in a fall from the scaffolding in 1179 he was replaced by one of his former assistants, known as "William the Englishman". In 1180-4, in place of the old, square-ended, eastern chapel, the present Trinity Chapel was constructed, a broad extension with an ambulatory, designed to house the shrine of St Thomas Becket. 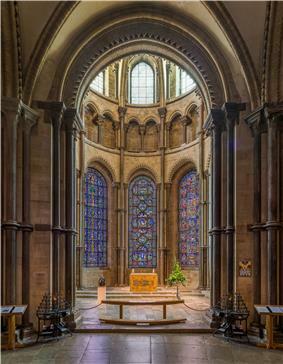 A further chapel, circular in plan, was added beyond that, which housed further relics of Becket,  widely believed to have included the top of his skull, struck off in the course of his assassination. This latter chapel became known as the "Corona" or "Becket's Crown". These new parts east of the choir transepts were raised on a higher crypt than Ernulf's choir, necessitating flights of steps between the two levels. 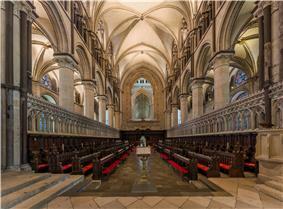 Work on the chapel was completed in 1184,  but Becket's remains were not moved from his tomb in the crypt until 1220. 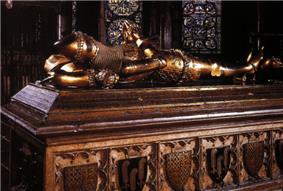 Further significant interments in the Trinity Chapel included those of Edward Plantagenet (The "Black Prince") and King Henry IV. 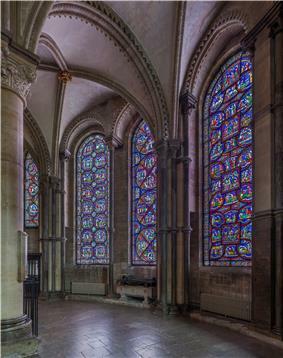 The shrine in the Trinity Chapel was placed directly above Becket's original tomb in the crypt. A marble plinth, raised on columns, supported what an early visitor, Walter of Coventry, described as "a coffin wonderfully wrought of gold and silver, and marvellously adorned with precious gems". Other accounts make clear that the gold was laid over a wooden chest, which in turn contained an iron-bound box holding Becket's remains. Further votive treasures were added to the adornments of the chest over the years, while others were placed on pedestals or beams nearby, or attached to hanging drapery. For much of the time the chest (or "ferotory") was kept concealed by a wooden cover, which would be theatrically raised by ropes once a crowd of pilgrims had gathered. Erasmus, who visited in 1512–4, recorded that, once the cover was raised, "the Prior ... pointed out each jewel, telling its name in French, its value, and the name of its donor; for the principal of them were offerings sent by sovereign princes." The income from pilgrims (such as those portrayed in Geoffrey Chaucer's Canterbury Tales) who visited Becket's shrine, which was regarded as a place of healing, largely paid for the subsequent rebuilding of the cathedral and its associated buildings. This revenue included the profits from the sale of pilgrim badges depicting Becket, his martyrdom, or his shrine. The shrine was removed in 1538. Henry VIII summoned the dead saint to court to face charges of treason. Having failed to appear, he was found guilty in his absence and the treasures of his shrine were confiscated, carried away in two coffers and twenty-six carts. A bird's-eye view of the cathedral and its monastic buildings, made in about 1165 and known as the "waterworks plan" is preserved in the Eadwine Psalter in the library of Trinity College, Cambridge. It shows that Canterbury employed the same general principles of arrangement common to all Benedictine monasteries, although, unusually, the cloister and monastic buildings were to the north, rather than the south of the church. There was a separate chapter-house. The buildings formed separate groups around the church. Adjoining it, on the north side, stood the cloister and the buildings devoted to the monastic life. To the east and west of these were those devoted to the exercise of hospitality. To the north a large open court divided the monastic buildings from menial ones, such as the stables, granaries, barn, bakehouse, brew house and laundries, inhabited by the lay servants of the establishment. At the greatest possible distance from the church, beyond the precinct of the monastery, was the eleemosynary department. The almonry for the relief of the poor, with a great hall annexed, formed the paupers' hospitium. The group of buildings devoted to monastic life included two cloisters. The great cloister was surrounded by the buildings essentially connected with the daily life of the monks,-- the church to the south, with the refectory placed as always on the side opposite, the dormitory, raised on a vaulted undercroft, and the chapter-house adjacent, and the lodgings of the cellarer, responsible for providing both monks and guests with food, to the west. A passage under the dormitory lead eastwards to the smaller or infirmary cloister, appropriated to sick and infirm monks. The hall and chapel of the infirmary extended east of this cloister, resembling in form and arrangement the nave and chancel of an aisled church. Beneath the dormitory, overlooking the green court or herbarium, lay the "pisalis" or "calefactory," the common room of the monks. At its north-east corner access was given from the dormitory to the necessarium, a building in the form of a Norman hall, 145 ft (44 m) long by 25 broad (44.2 m × 7.6 m), containing fifty-five seats. It was constructed with careful regard to hygiene, with a stream of water running through it from end to end. A second smaller dormitory for the conventual officers ran from east to west. Close to the refectory, but outside the cloisters, were the domestic offices connected with it: to the north, the kitchen, 47 ft (14 m) square (200 m2), with a pyramidal roof, and the kitchen court; to the west, the butteries, pantries, etc. The infirmary had a small kitchen of its own. Opposite the refectory door in the cloister were two lavatories, where the monks washed before and after eating. The buildings devoted to hospitality were divided into three groups. The prior's group were "entered at the south-east angle of the green court, placed near the most sacred part of the cathedral, as befitting the distinguished ecclesiastics or nobility who were assigned to him." The cellarer's buildings, where middle class visitors were entertained, stood near the west end of the nave. The inferior pilgrims and paupers were relegated to the north hall or almonry, just within the gate. Priors of Christ Church Priory included John of Sittingbourne (elected 1222, previously a monk of the priory) and William Chillenden, (elected 1264, previously monk and treasurer of the priory). The monastery was granted the right to elect their own prior if the seat was vacant by the pope, and — from Gregory IX onwards — the right to a free election (though with the archbishop overseeing their choice). Monks of the priory have included Æthelric I, Æthelric II, Walter d'Eynsham, Reginald fitz Jocelin (admitted as a confrater shortly before his death), Nigel de Longchamps and Ernulf. The monks often put forward candidates for Archbishop of Canterbury, either from among their number or outside, since the archbishop was nominally their abbot, but this could lead to clashes with the king and/or pope should they put forward a different man — examples are the elections of Baldwin of Forde and Thomas Cobham. The cathedral was seriously damaged by an earthquake of 1382, losing its bells and campanile. From the late fourteenth century the nave and transepts were rebuilt, on the Norman foundations in the Perpendicular style under the direction of the noted master mason Henry Yevele. In contrast to the contemporary rebuilding of the nave at Winchester, where much of the existing fabric was retained and remodelled, the piers were entirely removed, and replaced with less bulky Gothic ones, and the old aisle walls completely taken down except for a low "plinth" left on the south side. More Norman fabric was retained in the transepts, especially in the east walls, and the old apsidal chapels were not replaced until the mid-15th century. The arches of the new nave arcade were exceptionally high in proportion to the clerestory. The new transepts, aisles and nave were roofed with lierne vaults, enriched with bosses. Most of the work was done during the priorate of Thomas Chillenden (1391–1411): Chillenden also built a new choir screen at the east end of the nave, into which Eastry's existing screen was incorporated. The Norman stone floor of the nave, however survived until its replacement in 1786. 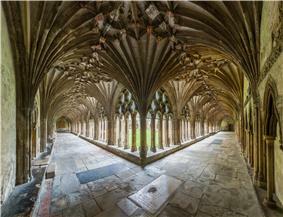 From 1396 the cloisters were repaired and remodelled by Yevele's pupil Stephen Lote who added the lierne vaulting. It was during this period that the wagon-vaulting of the chapter house was created. A shortage of money, and the priority given to the rebuilding of the cloisters and chapter-house meant that the rebuilding of the west towers was neglected. The south-west tower was not replaced until 1458, and the Norman north-west tower survived until 1834, when it was replaced by a replica of its Perpendicular companion. In about 1430 the south transept apse was removed to make way for a chapel, founded by Lady Margaret Holland and dedicated to St Michael and All Angels. The north transept apse was replaced by a Lady Chapel, built in 1448–55. The 235-foot crossing tower was begun in 1433, although preparations had already been made during Chillenden's priorate, when the piers had been reinforced. Further strengthening was found necessary around the beginning of the sixteenth century, when buttressing arches were added under the southern and western tower arches. The tower is often known as the "Angel Steeple", after a gilded angel that once stood on one of its pinnacles. The cathedral ceased to be an abbey during the Dissolution of the Monasteries when all religious houses were suppressed. Canterbury surrendered in March 1539, and reverted to its previous status of 'a college of secular canons'. The New Foundation came into being on 8 April 1541. In 1688, the joiner Roger Davis, citizen of London, removed the 13th century Gloucester Cathedral, Worcester Cathedral and New College, Oxford. The original Norman northwest tower, which had a lead spire until 1705, was demolished in 1834 owing to structural concerns. It was replaced with a Perpendicular-style twin of the southwest tower, now known as the "Arundel Tower"'. This was the last major structural alteration to the cathedral to be made. In September 1872 a large portion of the Trinity Chapel roof was completely destroyed by fire. There was no significant damage to the stonework or interior and the damage was quickly repaired. In 2015 Sarah Mullally and Rachel Treweek became the first women to be ordained as bishops in the cathedral. The cathedral is the Regimental Church of the Princess of Wales's Royal Regiment. Much of the stonework at Canterbury Cathedral is damaged and crumbling, the roofs are leaking and much of the stained glass is badly corroded. The last quinquennial structural review revealed that a combination of centuries of weathering, pollution and constant use had taken its toll on the ancient building and some serious problems were in need of urgent action. The single biggest challenge is the roof. The cathedral is covered by a huge expanse of lead and whilst the majority of the wooden framework remains sound, much of the lead itself needs replacing. In addition, a large amount of concrete encasing the bottom of the roof beams needs to be removed and replaced with traditional wooden footers. Conservation of the external masonry, particularly on the northern side of the building, is equally important. The cathedral is in part built of Caen stone. 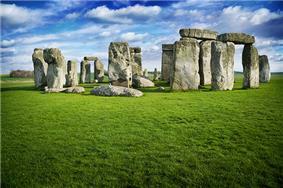 Detailed archaeological studies are undertaken to identify exactly which stones need to be replaced or repaired. In addition, specialist cleaning techniques are used to remove accumulated chemical deposits which are very damaging to the building. As regards the interior, priorities include decoration of the vaults of the Trinity Chapel, major improvements to the Treasury building which contains, amongst other things, the choir practice rooms, and conservation work in several other chapels. The earliest coloured glass windows in the cathedral date from the late 12th century, whilst others are as new as the four Ervin Bossányi windows in the south east transept (1957). Many have already been conserved and protected by the team of stained glass conservators led by Leonie Seliger. However, much conservation work remains to be done, notably on the Oculus window in the south east transept – a late 12th century round window. The Foundation is the authorised staffing establishment of the cathedral, few of whom are clergy. The head of the cathedral is the King's Scholars, the Six Preachers and a range of other officers; some of these posts are moribund, such as that of the cathedral barber. The cathedral has a work force of over 300 (many of whom work part-time), and approximately 800 volunteers. 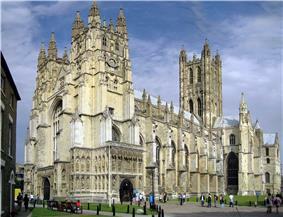 Canterbury Cathedral receives no government or state funding and only occasional grants from English Heritage. It is not funded by the Church of England. The Church Commissioners pay the salary of the dean and two of the residentiary canons only. The cathedral is therefore largely self-funded. Around £18,500 is spent each day on running costs. In order to meet these huge costs the cathedral has to rely on income from a number of commercial operations such as property rental, the Cathedral Shop, Hotel and Conference Centre and from entry charges to the cathedral. This income is only just sufficient, however, to cover the daily costs of running the cathedral and cannot meet the costs of the conservation and development projects that are vital for the survival of the building. 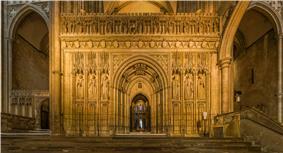 The "Save Canterbury Cathedral" appeal was launched in October 2006 to protect and enhance the cathedral's future as a centre of worship, heritage and culture. The aim was to raise £50 million; by the end of 2010 the appeal had raised £11.5 million, and as at May 2014 over £20 million had been raised. The core part of the fundraising programme is focused on the cathedral's fabric. The major conservation-restoration projects already identified will cost £30 million. Fabric conservation is the most urgent element of the campaign. The appeal - the third of its kind following major fundraising drives at Canterbury in the 1950s and 1970s - was launched to fund these projects. Fundraising for the appeal will take place over a number of years both nationally and internationally, stressing the cathedral's role as the mother church of the worldwide Anglican Communion and as a World Heritage Site. An integrated conservation programme that addresses the priority areas has been drawn up by the cathedral's Surveyor to the Fabric, John Burton. Major repair and conservation projects to be funded by the appeal include: roofs of the nave, aisles, and North West and South East Transepts; stone carvings, pinnacles and stone facings of the Bell Harry Tower; work on the North side of the Corona Chapel; conservation of the Christ Church Gate entry to the Precincts; conservation of stained glass and surrounding stonework throughout the cathedral; and preservation of the collection of historic books and manuscripts. In addition, there are plans to refurbish the cathedral Choir House have already been completed, providing better facilities for choristers. Improvements are planned to the fabric of the library buildings and to the cathedral's audio-visual and lighting systems which will significantly benefit visitors including the disabled, visually impaired and hard of hearing. The appeal also aims to develop the outmoded workshop area and stained glass studio, in order to ensure the survival of Canterbury as a centre of excellence for vital craft skills and to promote a sustainable maintenance base for work on the cathedral which can be viewed by the public. ^ Dudley 2010, p. 23. ^ Willis 1845, pp. 20–21. ^ Cook 1949, pp. 19–20. ^ Withers 1897, p. 4. ^ a b Cook 1949, p. 19. ^ Cook 1949, p. 23. ^ Willis 1845, p. xiv. ^ Willis 1845, p. 71. ^ Willis 1845, p. 79. ^ a b c d e Cook 1949, pp. 22–3. ^ Withers 1897, p. 88-9. ^ a b Withers 1897, p. 8. ^ Blick 2005, pp. 407–8. ^ a b Blick 2005, p. 408. ^ Blick 2005, p. 424. ^ Blick 2005, p. 425. ^ Withers 1897, p. 13. ^ a b c d e f g h Cook 1949, pp. 43–5. ^ Willis 1845, p. 45. ^ a b Willis 1845, p. 121. ^ Barrie Dobson, 'Canterbury in the Later Middle Ages, 1220–1540', in A History of Canterbury Cathedral, OUP 1995, p. 153. ^ Withers 1897, p. 27. ^ First female diocesan bishop in C of E consecrated. Anglicannews.org. Retrieved on 23 July 2015. The cathedral library has a collection of about 30,000 books and pamphlets printed before the 20th century and about 20,000 later books and serials. Many of the earlier books were acquired as part of donated collections. It is rich in church history, older theology, British history (including local history), travel, science and medicine, and the anti-slavery movement. The library's holdings are included in the online catalogue of the library of the University of Kent. The cathedral also has custody of the bell of HMS Canterbury, a World War I-era light cruiser, hung near the Buffs Chapel in the South West Transept. The oldest bell in the cathedral is Bell Harry, which hangs in a cage atop the central tower to which the bell lends its name. 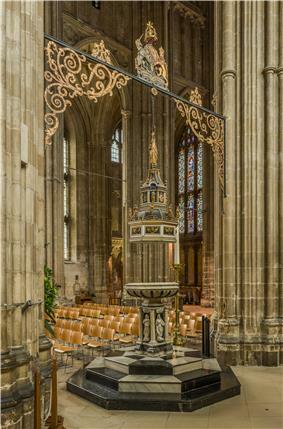 This bell was cast by Joseph Hatch in 1635, and is struck at 8am and 9pm every day to announce the opening and closing of the cathedral, and also occasionally for services as a Sanctus bell. In 1316 Prior Henry of Eastry gave a large bell dedicated to St Thomas, which weighed 71½ cwt (3.63 tonnes). Later, in 1343, Prior Hathbrand gave bells dedicated to Jesus and St Dunstan. At this time the bells in campanile were rehung and their names recorded as "Jesus", "Dunstan", "Mary", "Crundale", "Elphy" (Alphege) and "Thomas". In the great earthquake of 1382 the campanile fell, destroying the first three named bells. Following its reconstruction, the other three bells were rehung, together with two others, of whose casting no record remains. The North West Tower (Arundel Tower) contains the cathedral’s clock chime. The five quarter chimes were taken from the old peal of twelve in the Oxford Tower (where the clock was originally), and hung from beams in the Arundel Tower. The chimes are stuck on the eighth Gregorian tone, which is also used at Merton College, Oxford. The hour is struck on Great Dunstan, the largest bell in Kent 63cwt (3.2 tonnes), which is also swung on Sunday mornings for Matins. The South West Tower (Oxford Tower) contains the cathedral’s main ring of bells, hung for change ringing in the English style. There are fourteen bells – a ring of twelve with two semi-tones, which allow for ringing on ten, eight or six bells while still remaining in tune. 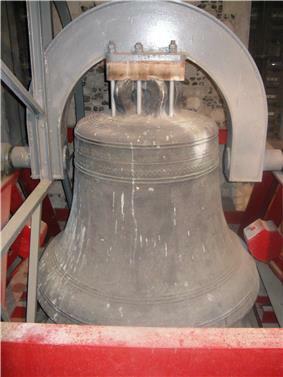 All of the bells were cast in 1981 by the Whitechapel Bell Foundry from seven bells of the old peal of twelve with new metal added, and re-hung in a new frame. The length (draught) of the ropes was increased by lowering the floor of the ringing chamber to the level of the south aisle vault at the same time, also allowing for the new bells to be set lower in the belfry than the old, with the intention of reducing strain on the Medieval structure. The heaviest bell of this ring weighs 34 cwt (1.72 tonnes). The ringers practise on Thursday at 7.15pm. The Girls' Choir of Canterbury Cathedral was founded in 2014 and their first performance at Evensong, in January, was attended by more than 600 people and widely covered by the international press. They gave their first concert in December of that year. They typically perform at Evensong twice every month, often with the Lay Clerks of the Cathedral Choir. The girls are aged twelve to eighteen. They attend local schools in Canterbury, and some further afield. 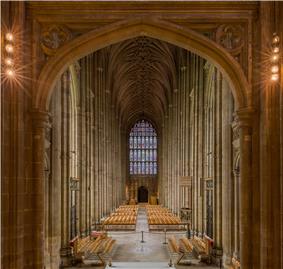 There has been a choral tradition at Canterbury Cathedral for 1400 years. The Cathedral Choir consists of 25 boy choristers and 12 lay clerks. The boys are aged eight to thirteen. They receive scholarships and attend St Edmund's School, Canterbury. There are seven choral services a week with Choral Evensong at 5.30pm on Monday-Friday, with the boys alone on Thursday and Men on Wednesday. On Saturday and Sunday there is evensong at 3.15pm and Eucharist on Sunday at 11am. There are numerous extra services especially at Christmas, Easter and Pentecost. Organists and Assistant Organists at Canterbury Cathedral have included composers organ scholarship.